Project Controls : What is it and why is it important ? "Project Controls are the data gathering, data management and analytical processes used to predict, understand and constructively influence the time and cost outcomes of a project or programme; through the communication of information in formats that assist effective management and decision making." This definition covers all stages of a project lifecycle from initiating and scoping the project through to closure, final learning from experience and analytical analysis of overall project performance. Where does Project Controls sit? Project Control professionals sit within the Project Team, work for, and are responsible to the Project Manager. They are the heart of the Project Team. If Project Management is concerned with making informed and accountable decisions project controls is about "informing, monitoring and analysing" – to exercise control it is necessary to be aware. 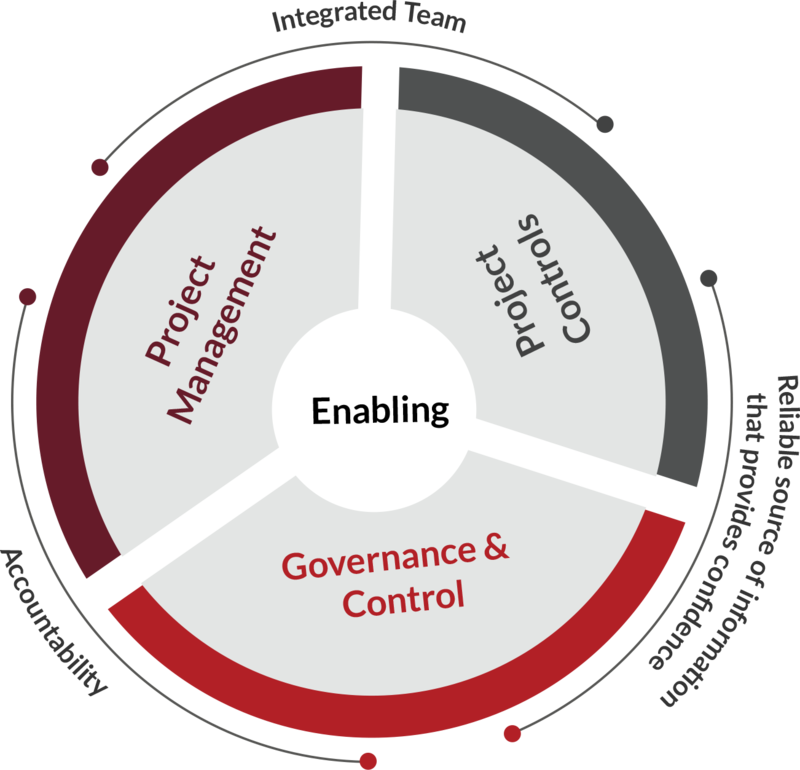 Project Control professionals generate and maintain the information that brings awareness to the Project Manager and Senior Managers so that control can be exercised. Component Elements of Project Controls. This is not an exhaustive list of all attributes of project controls, we believe it encompasses the key important ones. Project Structure from A Project Controls Perspective. At the core of a project that successfully delivered a required benefit will be an agreed project schedule that follows a few basic rules in its development and benefitted from a robust and complete Project Management Plan. Amongst other important elements contained within the Project management Plan would be a description of the project scope, the Work Breakdown Structure (WBS) and the Organizational Breakdown Structure (OBS). The WBS ties together the scope, schedule and costs of the project. It is output orientated and breaks down the project scope into deliverable items. It should be developed in parallel with benefit identification so that deliverable items can be mapped to required benefits. The WBS structure would normally follow the project budget structure and provide a framework for project reporting, it should be detailed to the lowest level of deliverable items. The OBS defines the organizational structure and the roles required within the project team to enable successful delivery. From the OBS it should be possible to identify specific accountability and responsibilities for delivery within the team. It enables resource requirement and management. Once the WBS and OBS are defined it allows a Responsibility Matrix to be developed that aligns people against deliverable items of the project scope, their accountability and levels of responsibility. It generates the basis of the projects control and assurance framework – including Control Accounts and Control Account Managers (CAM). The project will have identified a Cost Breakdown Structure (CBS) from the scope, WBS and OBS. It informs further project breakdown at increased levels of detail, reporting and budgeting requirements. The successful performance of a project depends on appropriate planning. The PMBOK Guide defines the use of 21 processes that relate to planning out of the 39 processes for project management, (Globerson & Zwikeal 2002). The execution of a project is based on a robust project plan and can only be achieved through an effective schedule control methodology. The development of a suitable Project Control system is an important part of the project management effort (Shtub, Bard & Globerson 2005). Furthermore, it is widely recognised that planning and monitoring plays a major role as the cause of project failures. Despite the continuous evolution in the project management field, it appears evident that the traditional approach still shows a lack of utilisation of Project Controls and there have been a number of articles published to support the importance of control in the achievement of project objectives. It has been proved time and again that Project performance can be improved if dedicated Project Controls systems are in place. An IBC 2000 Project Control Best Practice Study carried out by IPA identified that good Project Control practices reduce execution schedule slip by 15%. Project Controls cost range from 0.5% to 3% of total project, (including cost accounting), therefore, to break even, Project Control needs to improve cost effectiveness by around 2%. A sample study carried out by the IBC Cost Engineering Committee (CEC) in 1999, showed cost improvements for the projects in the study, was more than 10%. It is noted also that NPV (Net Project Value) also benefits from schedule improvements. Success factors are based on good Project Control practices, which result in good cost and schedule outcomes.